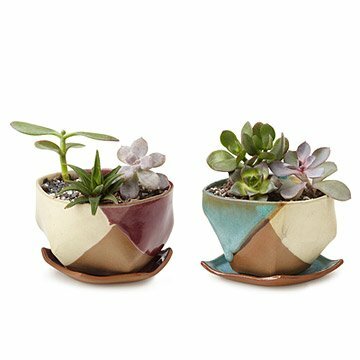 Bring a touch of the modern organic to your home office, kitchen table, or cozy patio with these faceted, stoneware planters. Inspired by mountainous landscapes, the hand-formed pots with matching dishes feature blue-green or plum purple and contrasting beach-white glazes. They make perfect pots for your houseplants, succulents, air plants, or cacti. Handmade by Kristen Saksa Juen in Texas. Searching for the perfect succulent to pair with your planter? Check out our list of easy-to-grow beauties on the blog. Krista grew up exploring nature and collecting everything from moss to dirt, fascinated by details she saw. Her passion for ceramics grew out of her desire to encourage curiosity, inspire creativity, and appreciate one of a kind, both for herself and those around her. She draws inspiration from textures and details found in nature. She values the individual uniqueness of handmade. Krista enjoys designing without rigid patterns or guidelines so that each piece grows into its own character and qualities. All her ceramics are designed and handmade with care and love for the process. Read a Q&A with Kristen on our blog. Grandma gave my daughter two orchids for Valentine's day. They were in little plastic pots, so I bought the lovely mauve planter to transplant the two small orchids into. The two orchids have flourished. So, I bought the blue to transplant the orchid that my daughter's boyfriend gave her for Valentine's Day, 2015. The are stunning in our kitchen picture window. I water the plants over the sink so that they can easily drain without making a mess. Bring a touch of the modern organic to your home with these faceted, stoneware planters.